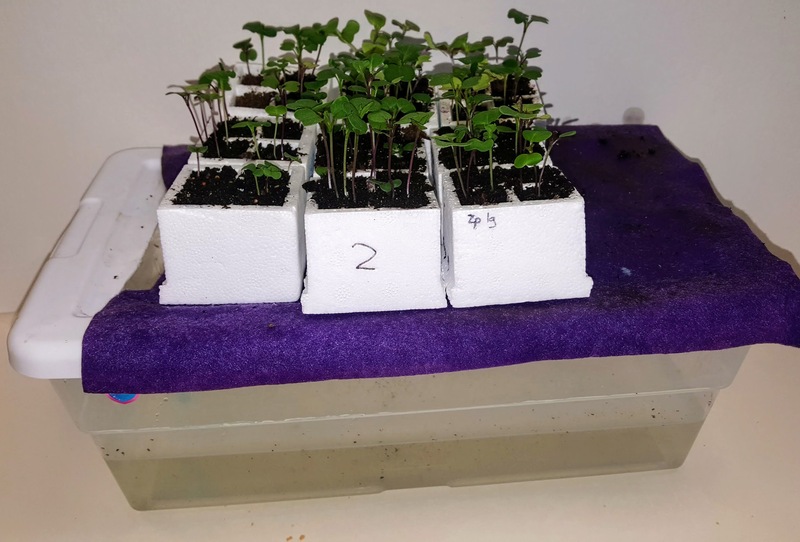 Plant growing system using a plastic bin, CFL lights, and aluminum foil. It’s not pretty, but it does work! Genetic Experiments can be intimidating for teachers due to the time and cost of breeding plants or animals in a classroom. These issues are further complicated in a public school setting which may have space issues, limited funds, and lack of access to labs. My favorite model for genetic experiments is the Wisconsin Fast Plant. You can set up and complete a genetics experiment using these plants in just a few days. You can spend a longer amount of time if you want students to have the experience of cross-pollinating and breeding plants. Fastplants.org has resources for growing the plants and buying seeds. It does not require an expensive set up. 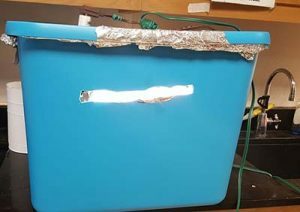 I grow my plants in a plastic bin lined with aluminum foil and holes cut in the lid to mount light bulbs attached to extension cords. It’s not pretty, but it is effective! In past years, I’ve given students a worksheet that provides information about the seed varieties and how we will grow the plants to determine the genotypes of the parents. Traditional labs often start with the answers, students already know that the parents were dihybrids and they are expecting to observe a 9:3:3:1 ratio in the offspring. In my version of the lab, students do not know what they are getting, and must determine the genotypes of the parents by collecting data on the offspring and performing a chi square analysis. Basically, I’ve changed the way you present the lab to turn it into an inquiry lesson where students do not know the genotypes of the parents. Critical analysis of the phenotypes of the offspring will give them the answer. This year, I skipped the worksheet and created presentation that walks students through the inquiry. Since the lab takes a couple of weeks, and students may be collecting data when you can fit into the daily lesson, the slides are an easy way to pick up where you left off. Most of the supplies needed can be purchased at hardware stores or department stores. Large plastic bins that are green in color are good, and often are marked down around the holidays. Supplies can be reused each year. 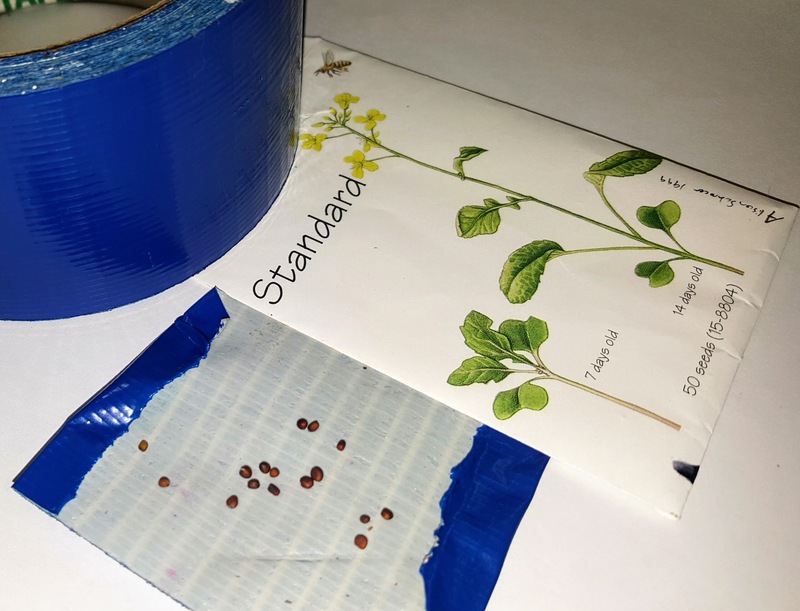 Tip: Place seeds on duct tape to give to students. Seeds can be planted in a variety of systems and Fastplants.org has a variety of methods that use cups and other cheap supplies. Some of the fun with the lab is showing students how to grow plants inside. 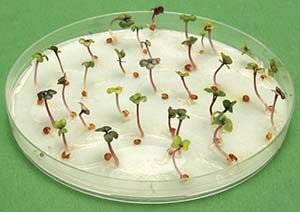 If you don’t plan to raise the plant to flowering, you can just grow them in a petri dish long enough to collect data on their phenotypes. I grow my plants in styrofoam quads, which are placed on a felt mat to wick moisture to the soil. Carolina also has entire kits which contain all you need to get started. They are kind of pricey though and once you learn how to do it, you can buy the supplies much cheaper. These quads have tiny wicks in the bottom of them and are sitting on a felt mat. The mat has an edge that is soaking in a plastic shoe box container so the system stays moist.